NOOSE, the first in a series of Western novels set entirely in Jackson Hole, Wyoming by acclaimed author and horror filmmaker Eric Red. Kensington describes the book as “Louis L’ Amour meets Pulp Fiction" and early reviews have termed it a fresh take on the classic Western and a fast-moving, gritty tale. This book is a fresh, new look into Westerns. 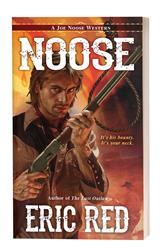 NOOSE, the first in a series of Western novels set entirely in Jackson Hole by acclaimed author and horror filmmaker Eric Red, has been released by Kensington Publishing in Mass Market Paperback and Kindle editions. Due to high reader demand from advance orders, NOOSE was already in its second printing before its official publication date. An action-packed chase set along the Snake River from Hoback to Jackson in the last years of the old west, NOOSE is the story of Joe Noose, a bounty hunter, who is framed by a violent gang as the killer of the U.S. Marshal in Hoback. He sets out to clear his name and is chasing the gang as is new U.S. Marshal Bess Sugarland, determined to bring her father’s murderer to justice. “Jackson’s history of women in positions of influence led me to have compelling women characters like Marshal Bess who is a key player throughout the series,” said Red, a part-time resident of Wilson, Wy. He noted that Jackson’s first all female city council is featured in NOOSE. “The balance of strong women characters with men in the book is drawing many more women readers than the typical Western novel,” he added. Kensington describes the book as “Louis L’ Amour meets Pulp Fiction ” with Red bringing his trademark volatile action and bloody violence to the popular genre. Early reviews have termed it a fresh take on the classic Western and a fast-moving, gritty tale. Red is the writer of such blockbuster films as The Hitcher, Near Dark, and Blue Steel, and writer/director of Cohen & Tate, Body Parts and 100 Feet. This is his sixth novel and first Western but has contracted with Kensington for at least three Joe Noose Westerns, all of which will be set in Wyoming.